Most retrosternal goiters are situated in the anterior mediastinal compartment. Posterior mediastinal goiters are uncommon, comprising 10%–15% of all mediastinal goiters. Although most of the anterior mediastinal goiters can be removed by a transcervical approach, posterior mediastinal goiters may require additional extracervical incisions. We report the case of a large posterior mediastinal goiter extending retrotracheally beyond the aortic arch and azygous vein with crossover from the left to the right side. It was excised using a transcervical and right thoracotomy approach. 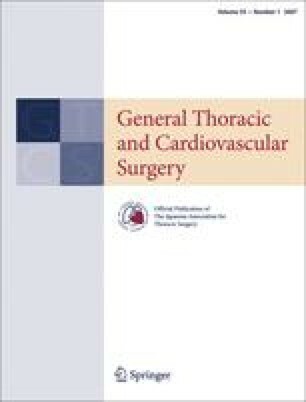 The literature is reviewed to clarify the management of retrosternal goiters with regard to the various approaches, indications for extracervical incisions, and their complications. In conclusion, whereas most retrosternal goiters can be resected through a transcervical approach, those extending beyond the aortic arch into the posterior mediastinum are better dealt with by sternotomy or lateral thoracotomy. The overall number of complications associated with this approach, however, is higher than that seen with the transcervical approach.